It's our traditional holiday Rudolph the Red Nosed Reindeer display--in Dexter terms, a tableau (without the dead bodies). Also please note the headless reindeer, my favorite Christmas tradition. 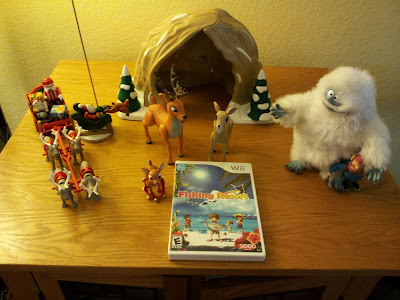 You might also note that an interloper has been added: "Fishing Resort" for the Wii, a game I have been looking forward to since the day it was announced. I have a long-standing affection for fishing in games, be they fishing-themed (Sega Bass Fishing, Reel Fish'n, Virtual Deep Sea Fishing) or just incidental (Dark Cloud 2, Fate, Everquest). Plus, it was developed by Yuji Naka (Sonic The Hedgehog, Nights Into Dreams...). Why do I have time to play this one I don't have time to play Skyrim? A fair question, and the answer is that Eli 10.4 and I can play this together. Since he was out sick all last week, we passed some of the time playing Fishing Resort. How is it? In a word: fun. The world is bright, the weather is warm, the beach is always clean, and there are plenty of fish to catch. Or you can bicycle around the island, if you prefer, or go kayaking, or travel on a submarine. If you'd like to stay indoors, you can look at the aquarium, which is stocked with the fish you've caught. Oh, and you can expand the aquarium, if you'd like, and aquarium visitors pay admission prices, and you'll get a portion of those proceeds. The aquarium is a good example of why Fishing Resort works so well: the gameplay may be generally familiar, but there are infinite combinations of that gameplay drilled down to substantial depths. And it's a very well-designed game, with a simple but effective structure of multiple locations along with a hotel bulletin board in each location serving as an activity hub. If you're wondering about the fishing, it's very solid. Float or lure fishing, many choices for rods and reels, even more choices for bait or lure type, and a gigantic array of fish to catch. Plus, even in the first location, you can fish from the beach, a pier, a charter boat, a kayak, or rocks/cliffs near the beach. Basically, any place there's water, you can drop a line. The game is also absolutely stuffed full of personality--it's a happy island, full of life. There are plenty of people to talk to, who offer both challenges and useful information, and even with the Wii's limited graphics capability, the island is quite beautiful. What shines through, in particular, about this game is the loving attention to detail. The degree of polish is very high, and the world is very full. This also makes it more engaging, and both Eli and I have very much enjoyed our time with the game. We've spent roughly 6 hours on the island's first location, without exhausting all the quests and mini-games. Of course, you don't have to do any quests or mini-games unless you want to--what you do is entirely up to you. Oh, and remember what I said about the beach? Well, there are plenty of locations in the game, and most of them aren't beach at all. Some are saltwater, some are freshwater, some hot, some cold, some deep water, some shallow water. If you're thorough, I could see playing through the full game taking upwards of 50 hours. John Harwood let me know that there is a co-op mode (the second person only appears when fishing, but both player's points from catching fish contribute to the point total), but we haven't even tried it yet. This is the kind of game where it's very pleasant to watch someone else playing, so Eli and I have just passed the controller back and forth. One note: there is an optional "fishing controller" that comes with the $29 game package (by itself, the game is $19, which is quite a bargain), but trust me, you don't want the controller. It's a bit clunky, it adds nothing to the game, and it actually makes it harder to reel than if you just used the regular controller and nunchuk. So save yourself $10, and go for the standard edition instead.